Introduction: Malaria is among the most significant travel-related infections encountered by travelers to endemic countries in terms of morbidity and mortality. In Qatar, imported malaria has increased over the last 5 years; 493 travel-related cases were confirmed in 2016. In the current study, the knowledge of malaria chemoprophylaxis among physicians in the State of Qatar was assessed. Methods: This was a cross-sectional study conducted during a national travel health workshop at the Ministry of Public Health, Qatar. Physicians participating in the workshop from different national healthcare institutions providing travel medicine services were invited to voluntarily complete a self-administered, structured questionnaire. Results: Forty-two medical doctors participated in the study (92 response rate). Based on their specialty, almost two-thirds (64.3%) of the participants were family medicine physicians, and one-fifth (21.43%) were general practitioners. Furthermore, most of the doctors were untrained in travel medicine. The majority of participants demonstrated a good knowledge of the malaria parasite (100%), Plasmodium species (64.3%), incidence (83.3%), transmission (66.7%), and drug-resistance (95.2%) of malaria. Additionally, most physicians (>90) were knowledgeable about the major features of severe or complicated malaria as well as malaria prevention and chemoprophylaxis. Conclusion: This study highlights several areas of good knowledge on travel-related malaria prophylaxis and prevention among the study participants; however, there are still a few knowledge gaps that require mitigation. Continuing training programs on malaria prevention in travelers will sustain this good level of knowledge among physicians and improve the quality of pre-travel advice provided by travel medicine practitioners in Qatar. Malaria Risk Assessment for Travelers. The Centers for Disease Control and Prevention (CDC) website. https://www.cdc.gov/malaria/travelers/vfr.html. Published 2017. Loutan L. Malaria: still a threat to travellers. Int J Antimicrob Agents. 2003;21(2):158-163. doi:10.1016/S0924-8579(02)00367-9. Iqbal J, Hira PR, Al-Ali F, Sher A. Imported malaria in Kuwait (1985-2000). J Travel Med. 2003;10(6):324-329. doi:10.2310/7060.2003.9291. Ismaeel AY, Senok AC, Jassim Al-Khaja KA, Botta GA. Status of malaria in the Kingdom of Bahrain: a 10-year review. J Travel Med. 2004;11(2):97-101. doi:10.2310/7060.2004.17059. Meleigy M. The quest to be free of malaria. Bull World Health Organ. 2007;85(7):507-508. doi:10.2471/BLT.07.020707. Beljaev AE. [The malaria situation in the WHO eastern Mediterranean region]. Med Parazitol (Mosk). 2000(2):12-15. Snow RW, Amratia P, Zamani G, et al. The malaria transition on the Arabian Peninsula: progress toward a malaria-free region between 1960-2010. Adv Parasitol. 2013;82:205-251. doi:10.1016/B978-0-12-407706-5.00003-4. World Health Organization. World Malaria Report 2011. http:// www.who.int/malaria/world_malaria_report_2011/en/. Accessed August 8, 2017. Published 2011. Shibl A, Senok A, Memish Z. Infectious diseases in the Arabian Peninsula and Egypt. Clin Microbiol Infect. 2012;18(11):1068- 1080. doi:10.1111/1469-0691.12010. Al-Kuwari MG. Epidemiology of imported malaria in Qatar. J Travel Med. 2009;16(2):119-122. doi:10.1111/j.1708-8305.2008.00285.x. Khan FY, Lutof AK, Yassin MA, et al. Imported malaria in Qatar: a one year hospital-based study in 2005. Travel Med Infect Dis. 2009;7(2):111-117. doi:10.1016/j.tmaid.2009.01.003. Ministry of Public Health. MOPH Annual Report Public 2016. Qatar: MOPH; 2017. Mikhail MW, Al-Bursheed KM, Abd El-Halim AS, Morsy TA. Studies on mosquito borne diseases in Egypt and Qatar. J Egypt Soc Parasitol. 2009;39(3):745-756. Recommendations for Immigrants from Malaria-Endemic Countries Planning to Return “Home” to Visit Friends and Relatives. The Centers for Disease Control and Prevention (CDC) website. https://www.cdc.gov/malaria/travelers/vfr.html. Published 2017. Schwartz E. Prophylaxis of malaria. Mediterr J Hematol Infect Dis. 2012;4(1):e2012045. doi:10.4084/mjhid.2012.45. Krause G, Schoneberg I, Altmann D, Stark K. Chemoprophylaxis and malaria death rates. Emerg Infect Dis. 2006;12(3):447-451. doi:10.3201/eid1203.050736. Chaves TD, Monteiro WM, Alves JR, Lacerda M, Lopes MH. Pre-travel malaria chemoprophylaxis counselling in a public travel medicine clinic in Sao Paulo, Brazil. Malar J. 2017;16(1):64. doi:10.1186/s12936-017-1713-3. World Health Organization EMRO. Malaria Control and Elimination - Malaria country profiles (Qatar). http://www.emro.who.int/malaria/publications/malaria-country-profiles-2012.html. Accessed August 8, 2017. Published 2012. Mace KE, Arguin PM. Malaria Surveillance - United States, 2014. MMWR Surveill Summ. 2017;66(12):1-24. doi:10.15585/mmwr.ss6612a1. Chen LH, Wilson ME, Schlagenhauf P. Prevention of malaria in long-term travelers. JAMA. 2006;296(18):2234-2244. doi:10.1001/ jama.296.18.2234. Stoney RJ, Chen LH, Jentes ES, et al. Malaria Prevention Strategies: Adherence Among Boston Area Travelers Visiting Malaria-Endemic Countries. Am J Trop Med Hyg. 2016;94(1):136-142. doi:10.4269/ajtmh.15-0565. Fernando SD, Dharmawardana P, Semege S, et al. The risk of imported malaria in security forces personnel returning from overseas missions in the context of prevention of re-introduction of malaria to Sri Lanka. Malar J. 2016;15(1):144. doi:10.1186/s12936-016-1204-y. Mawhorter SD. Travel medicine for the primary care physician. Cleve Clin J Med. 1997;64(9):483-492. doi:10.3949/ccjm.64.9.483. Keystone JS, Dismukes R, Sawyer L, Kozarsky PE. Inadequacies in Health Recommendations Provided for International Travelers by North American Travel Health Advisors. J Travel Med. 1994;1(2):72- 78. doi:10.1111/j.1708-8305.1994.tb00566.x. Hoveyda N, McDonald P, Behrens RH. A Description of Travel Medicine in General Practice: A Postal Questionnaire Survey. J Travel Med. 2004;11(5):295-299. doi:10.2310/7060.2004.19105. Huang HL, Chiu TY, Huang KC, Cheng SY, Yao CA, Lee LT. Travel-related mosquito-transmitted disease questionnaire survey among health professionals in Taiwan. J Travel Med. 2011;18(1):34-38. doi:10.1111/j.1708-8305.2010.00483.x. Ropers G, Krause G, Tiemann F, Du Ry van Beest Holle M, Stark K. Nationwide survey of the role of travel medicine in primary care in Germany. J Travel Med. 2004;11(5):287-294. doi:10.2310/7060.2004.19104. Pavli A, Lymperi I, Katerelos P, Maltezou HC. Knowledge and practice of malaria prophylaxis among travel medicine consultants in Greece. Travel Med Infect Dis. 2012;10(5-6):224-229. doi:10.1016/j.tmaid.2012.09.006. Chiodini J. The standard of malaria prevention advice in UK primary care. Travel Med Infect Dis. 2009;7(3):165-168. doi:10.1016/j. tmaid.2009.02.003. Porter JF, Knill-Jones RP. 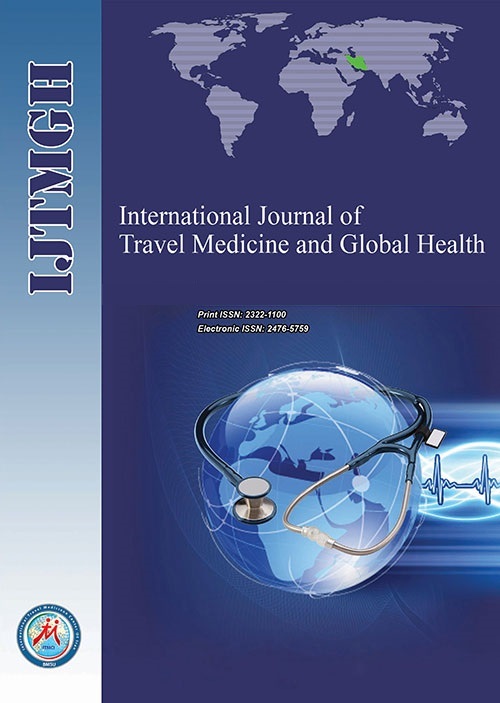 Quality of travel health advice in higher-education establishments in the United Kingdom and its relationship to the demographic background of the provider. J Travel Med. 2004;11(6):347-353. doi:10.2310/7060.2004.19202.